(F)ish Killed due to hypoxia/algae. 11 high powered overlapping pulsed microwave radars. 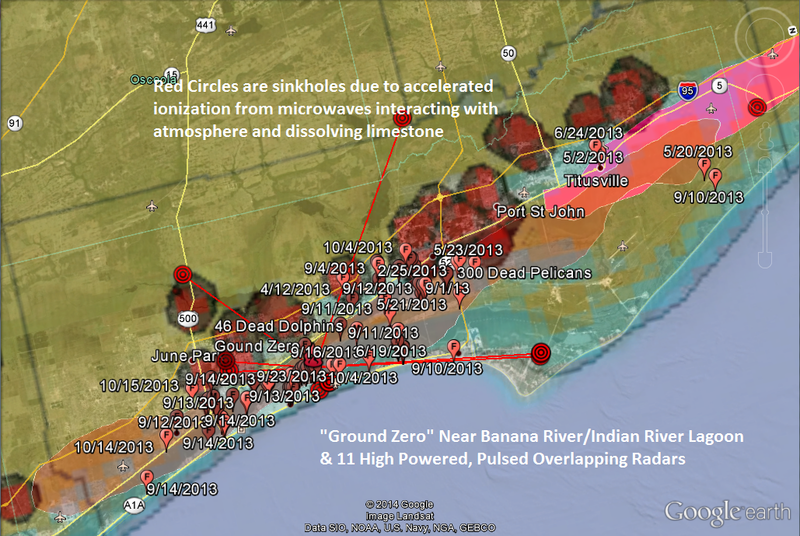 Also a bunch of sinkholes (red blobs) in the area – SOMETHING IS DISSOLVING CaCO3 in the area. The greatest concentration of dolphin, manatee and brown pelican deaths have occurred along the waterway between Patrick Air Force Base and the Thousand Islands. Yet no public or private entity is monitoring water quality from the area’s sewage treatment discharges and raw stormwater runoff. Those instantaneous induced currents in human’s bodies as the Doppler EMF fluxes are dissipated will also trigger all kinds of biological malfunctions, of which we give names like encephalitis, epililepsy, autism, MS, RNA/viral damage and a whole host of cancers and other oxidative stress disorders as the oxygen is ionized right out of our bloodstreams triggering free radical damage. Luckily our heads/bodies have less surface area than the lagoon and it only gets a few million of us…. But don’t believe me, believe nature. « Baby Einstein or Zombie Baby?